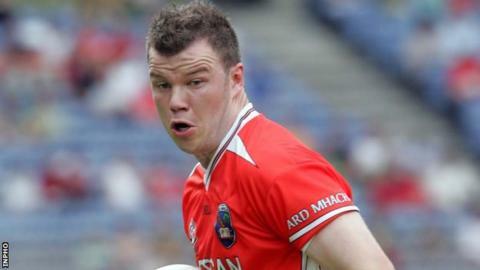 Former Armagh GAA star Ronan Clarke remains in a "serious but stable condition" in hospital after being injured in a club game on Friday night. Clarke, 32, is being treated at Craigavon Hospital after sustaining a head injury while playing for his club Pearse Og against Maghery. He was said to be "serious but stable" on Saturday night and that remained the position on Sunday and Monday. His club said on Sunday that he was making "slow but steady progress". The 32-year-old is understood to have sustained a head injury after colliding with a goalpost while playing in Friday night's game. Forward Clarke was a member of the Armagh side which won the All-Ireland Football Championship in 2002. He has been honoured in the GAA's end-of-season All-Star awards on two occasions.